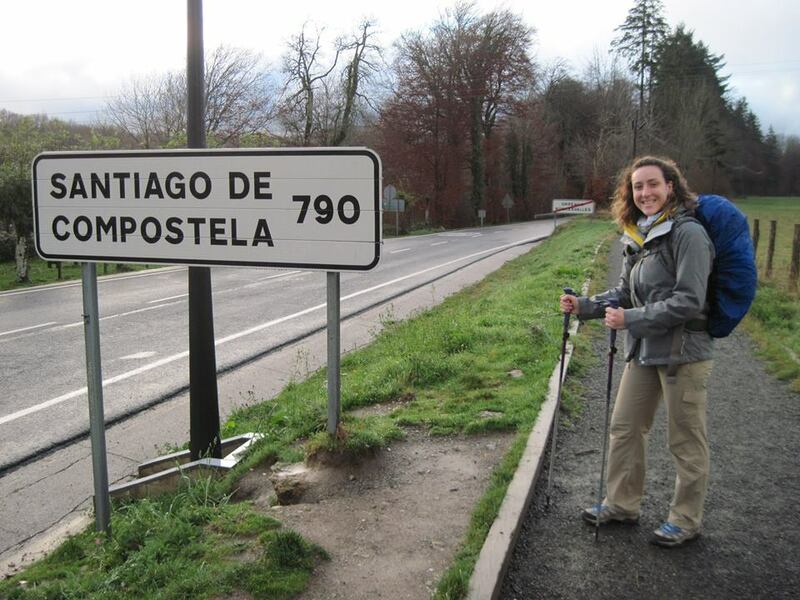 On our way out of town, we took a few photos next to the road marker: 790 km to Santiago de Compostela. It’s kind of a rite of passage, I guess, to show the first steps taken in one’s pilgrimage. I like to tell people though, that the pilgrimage starts when you decide to go, when you make your first pronouncement to your family and your friends that you are going to Spain to walk the Camino. Still, that moment when you see the first sign is pretty special if for no other reason you can see how much weight you’ve lost when you get where you’re going and take pictures in front of the cathedral! It was the first Sunday in Advent. Walking was uneventful until we got to this stretch of downhill over rock. It had rained a bit and the surface of the rocks was slick, meaning slippery rock after slippery rock. When we finally landed in Zubiri, I wanted to stop at the very first place – which turned out to be quite nice. A pension, with a son who had to ask his mother if it was OK for us to stay. We were not the only pilgrims. In fact, we met later a young man who was walking back from Santiago who stayed at the albergue, closer to town. We went to find dinner and ended up having breakfast in the same little place the next morning. Unfortunately, I missed packing my second pair of shoes in Zubiri – leaving behind, by accident, the one thing I knew would save my feet. What I learned was two-fold: be sure to pack your shoes if you take them out of your backpack for any reason, and realize that you don’t really need them, after all. I did fine – not fabulous, but just fine. Remarkably, the next day we’d already be on our way to Pamplona. I was looking forward to photographing the cathedral and shopping at the Camino store there. Neither were open. Posted in General Info. Tagged backpacking, caminodesantiago, cathedral, hiking, pilgrim, Spain, travel, walking.